It is not uncommon for a parent to experience a child who is a picky eater. This phenomenon occurs in both boys and girls regardless of ethnicity and economic background. For example, a child might insist on eating only one particular food item at each meal or display fear when introduced to new foods. They can even completely refuse to eat the food on his/her plate. 1. Keep Trying--Repeatedly offering a food item during mealtimes will increase the chance that the child will finally eat it. Studies show that it may take 8-15 attempts before a child will finally taste the food. 2. Involve Children in Meal Preparation and Cooking--Becoming familiar with a food item can help overcome a child’s hesitancy to try it. Studies show that when children engage in meal planning and preparation, they are less likely to be picky eaters. Children involved in grocery shopping, gardening and meal preparation will significantly increase the likelihood that they will eat the food prepared for them. Children can help select foods when shopping for groceries or even help create the menu. Young children can retrieve items from the pantry, garden or refrigerator. They can also help measure and stir various ingredients. Older children can help read and follow recipes. 3. Role Model Healthy Eating Habits--Children learn by watching and listening. Parents can set a good example by eating a variety of healthy foods. 4. Be Patient Especially with New Foods--Remember, a child might taste a certain food item ten or even twenty times before eating it. 5. Make Meals More Fun—There is a variety of visual tools you can use to make nutritious meals pleasant and even exciting for children. Try using bright colors, unique shapes and special plates. Be sure to discuss the benefits of good eating right from the start. 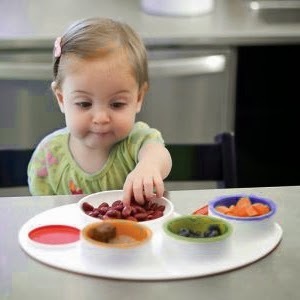 For example, children love finger foods and anything prepared in miniature sized arrangements. Try bite-size chunks of fruit, cheese or berries. A colorful bowl, special plate or fancy fork can make a child feel special during meal time. You can also use seasonal cookie cutters to transform ordinary sandwich bread into special shapes for snacks or lunches. Begin the year with strategies to help picky eaters eat right!